Capital gains represent the profits generated from buying and selling an investment. For stock investing, determine the gain (or loss) based on the proceeds from the sale of the investment. This calculation involves subtracting the cost of shares when purchased from the price of shares when sold. Generally, I can include commissions and transaction fees to acquire shares in the cost of shares; the entire cost is called its cost basis or just “basis.” Likewise, I can typically deduct the commissions to sell shares from my proceeds. Capital gains from stock investing are classified as either short term or long term. There are two types of capital gains in stock investing. A short-term capital gain occurs when I generate a profit on shares held one year or less. A long-term capital gain happens when I make money on shares held more than one year. I should track when I purchase shares so I'll know whether selling them will trigger a short-term or long-term gain (or loss). Typically, my broker will have records of purchase dates for reference and tax reporting purposes. Note that if the investment loses value and I lose money on the sale, I'll experience a capital loss. Long-term capital gains receive favorable (lower!) tax treatment. Short-term capital gains are taxed at ordinary income tax rates, similar to earned income. Long-term capital gains are taxed at different rates based on (but not the same as) ordinary income tax brackets. Taxes are applied at various tiers of income as indicated by the tax brackets. Tax rates for long-term capital gains are based on combined taxable income (various sources of ordinary income such as earned income plus long-term capital gains) and associated tax brackets; they are much lower percentage-wise than taxes on other forms of income. Capital gains can be offset by capital losses. Generally, capital losses offset capital gains, reducing tax liability. In a given year, I can offset gains with up to $3,000 of losses (or $1,500 if married, filing separately) to lower my income. Losses not deducted can be carried over to subsequent tax years. I don't pay capital gains taxes when gains occur inside of tax-advantaged accounts. When I hold investments inside of a tax-advantaged account, such as a traditional IRA, typically I do not pay capital gains taxes in the year of the gain. However, I may owe taxes on these gains at ordinary income tax rates when I make withdrawals, depending on the account's structure. Gains from the sale of investments held in regular taxable accounts can trigger tax liabilities, particularly when I sell stocks for more than the original purchase price. 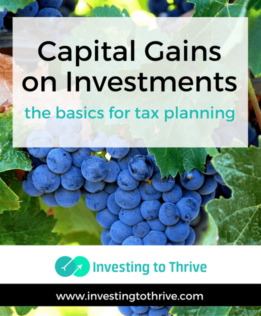 Knowing the basics of capital gains taxes can be useful when planning investment strategies and controlling my tax liability.